The term ‘screenager’ is becoming increasingly common and it’s not hard to see why. The amount of screens that young people have access to in their everyday life is huge. With a growing number of schools using technology like iPads and Tablets as part of the educational experience, teens can spend a huge amount of their day looking at a screen. 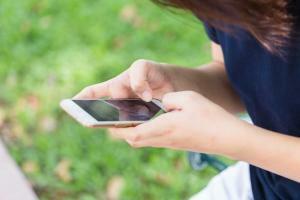 Teens, in particular use messaging apps on mobile phones to regularly message each other. Again screens are central to this experience. The amount of time spent on screens can be an area of contention for families and can undoubtedly be a tricky subject to broach and manage. Delaney Ruston, is a US based family doctor and documentary filmmaker. Her most recent documentary, Screenagers: Growing Up in the Digital Age, looks at the challenges faced by teenagers in living in a world surrounded by technology. In a recent interview she spoke about why it is important to balance screentime for teenagers. ‘The dopamine in our brains is most active during the teenage years, so screen time is more compelling during these years, too. The idea that we can just tell teenagers, “Do it less” or, “Find moderation on your own” is not going to promote the kind of self-control that we want them to develop’. Ruston suggests the idea of creating screen free zones in our homes and that by doing something like this we are doing a favour for teenagers. It can of course be a challenge to negotiate with your child about something like screentime, particularly if they are older and have access to a range of devices. So what can you do to help your teenager create healthy habits around the time they spend on screens? Talk to your teenager about the research behind the use of screens, particularly the blue light that can affect the levels of dopamine in the brain and interfere with sleep. Knowing that there is concrete research behind the impact of screens can help teenagers to feel empowered, as opposed to being told something by an adult. Also, involve all of the family in having times during the week and/or during the weekend when there is a time that you as a family do an activity that does not involve screens. Reminding your teen of the importance of not relying on communicating via messaging and how important it is to communicate with their friends in the more traditional face to face way is also important. Remember that creating balance is a two way street, in other words if you have agreed that if time is spent off screens that there will be a reward of some kind for that, that should be followed through. Also, there is no substitute for good role modelling; if you want your teenager to be more balanced in their use of screens try to practice this yourself. Helping teenagers to make smart choices around creating a balance in relation to the amount of time they spend on screens essentially involves empowering them through education and keeping the lines of communication open! Screens are now an integral part of daily life, having the knowledge to be able to create a balance in using them is a great step for all the family!